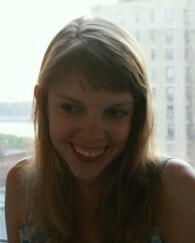 Iza Wojciechowska is a writer, editor, and translator living in Durham, NC. She has an MFA from Columbia with concentrations in creative nonfiction and literary translation, and is currently at work on a book about aristocracy, family, art, and war and the Polish palace of Nieborów. She also translates poetry by the contemporary Polish poet Anna Piwkowska. She has received grants and fellowships from the New York State Council on the Arts, the Kosciuszko Foundation, and the American Institute of Polish Culture. She likes elephants, books, and getting mail.